I was excited to see that a recent update from VMUG I received a couple of days ago hinted at the possibility of VMware NSX being included in a future “package” of the VMUG EvalExperience membership. This is exciting news (well nothing official as of yet, but rumblings are promising) as for many, NSX has been one of the missing pieces of the major technologies from VMware to round out the offering from VMUG. So with the news of VMUG Advantage EvalExperience NSX package hinted, for those SDN geeks out there, this is welcome indeed! 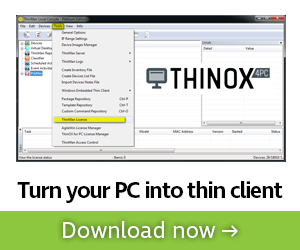 VMUG Advantage EvalExperience is a great addition to your home lab as it allows you to test drive the latest and greatest technologies from VMware for a very reasonable price. 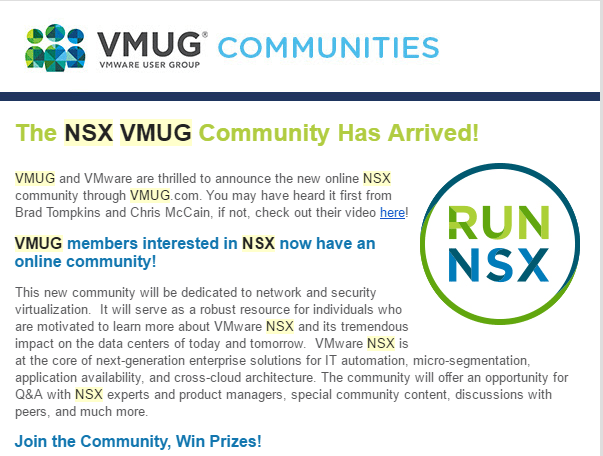 With the formation of the NSX community, VMUG is giving away training and exam vouchers and other goodies to jump start the community formation, so a great time to join and start winning prizes! VMUG is definitely gaining traction in the VMware community space as the premier place to gain knowledge, community help as well as take advantage of great learning tools for your home lab by way of the VMUG Advantage EvalExperience program to kick the tires on the latest offerings from VMware. With the VMUG Advantage EvalExperience NSX package hinted, if realized, will definitely sweeten the deal considerably for VMUG Advantage subscribers. Stay tuned and join the VMUG NSX community for the latest. As always, we will post the latest goodies here as well!